This is our complete overview of the Ranger Javelin class in Anthem. 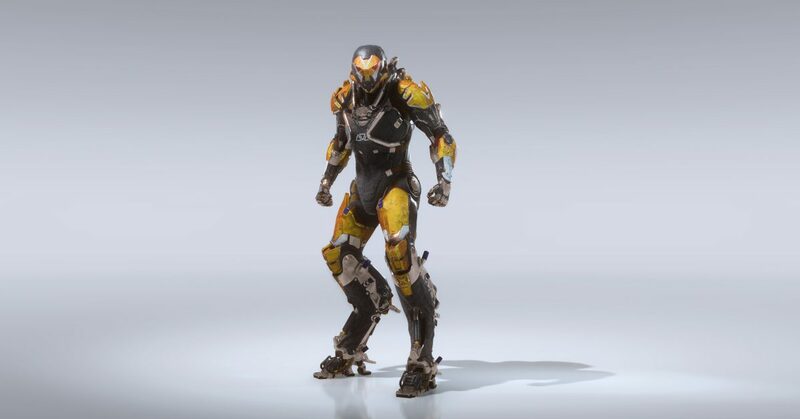 There's a total of four Javelins to choose from near the beginning of Anthem, and the Ranger is the most balanced of those exosuits. In this Anthem Ranger Javelin guide, we'll be walking you through absolutely everything you need to know about the exosuit, including details on the best Anthem Ranger build, should you wish to maximise damage output. If you instead need any additional information on anything relating to BioWare’s Anthem, you can head over to our Anthem guides hub. Here we’ve compiled a primer on the story going into the game, as well as an overview of the limited demo dates for Anthem. As we mentioned at the top of this guide, it’s the Ranger that you’re going to start out with in Anthem. Although you’ll be able to unlock and then switch between any of the additional three types of Javelins later in Anthem (these being Storm, Colossus, and Interceptor), you’ll begin the game with this, the most versatile exosuit in Anthem. As a rule, every type of Javelin in Anthem has two slots for weapons. These include weapon types like assault rifles, sniper rifles, pistols, and shotguns, and the Javelin can equip any type of weapon in Anthem, with the exception of heavy weapons like rocket launchers, which can only be equipped by the Colossus Javelin. The Ranger Javelin has the Shock Mace melee ability in Anthem. You can use this special ability to deploy a shocking mace against your enemies in Anthem, which sends a deadly amount of voltage, although we’re not currently sure if this can chain between multiple enemies. Frag grenade - Your standard grenade, which sends out a sharp blast over a fairly wide area. Inferno grenade - Sets a certain area on fire, dealing constant damage to enemies caught in the blaze. Frost grenade - Damages and freezes enemies within a certain area, temporarily freezing them in place. Seeker grenades - A grenade that splits off into small sub-grenades, which seek out nearby enemies. Sticky bomb - This grenade attaches to single target, and deals a concentrated blast. Homing missile - Fires off a small projectile which seeks out the nearest enemy. Energy pulse - Unleashes a blast of energy which deals high damage to a single target. Spark beam - Fires a single sustained beam for continued damage. Venom darts - An attack that seeks out multiple enemies for sustained acid damage. Blast missile - Fires a single missile that explodes across an area. Bulwark point - Deploys a small energy field which deflects all incoming fire. Muster point - Deploys a field which increases weapon damage output for all teammates within the radius. Finally, your Javelin class in Anthem will always have an Ultimate Ability, which is exclusive to the type of Javelin that you’re in. The Ranger Javelin’s Ultimate Ability is known as Multi-Target Missile Battery, and allows you to automatically scroll over multiple enemies, tagging them for targeting by your missiles in the process. We've spent a bunch of time playing Anthem over the last week or so. There are many ways you can set up your Ranger javelin for maxinmum effect, but a few are definitely more effective than others. To help you tweak your Ranger to the best of its capabilities, we've put together this Anthem Ranger Best Loadout Guide. You'll find the info below. This build works best as a mid-long range affair, and focuses on long-ranged priming and detonating of the combo system. For gear, we recommend using the Stick Grenades. These can be used as a detonator and have great range. Muster Point is great Support Gear, as it allows you to crank up your gun damage output, tiding you over while your abilities recharge. Over on the Components side of things, stack anything that increases weapons damage and combo damage. We recommend the Ranger Combo Augment. And as of right now, this is a complete roundup of all the information you need to know about the Ranger Javelin in Anthem. For now, you can head over to our Anthem Colossus Javelin guide, or our Anthem Stronghold mode guide for more.